In the splendid and rich collections of the Armoury Chamber of the Moscow Kremlin Museums is stored a unique East Asian helmet currently inventoried as OR–2057. Over the past two hundred years, images and brief descriptions of this item have been repeatedly reproduced in various works from military history to philology. However, the helmet OR–2057 has not yet been the subject of independent scientific weapons research. The purpose of this paper is to provide a detailed description of the construction and decoration of the helmet OR–2057, as well as to confirm its dating and attribution. The complex research and analysis of material, written and pictorial sources made it possible for us to clarify the dating and attribution of the helmet OR–2057, as well as the circumstances of its receipt into the Armoury Chamber of the Moscow Kremlin. 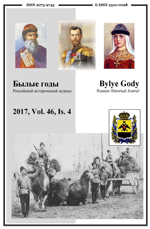 The first mentions of the helmet in the Russian service documentation are connected with the embassy of Stepan Grechenin and Bazhen Kartashev sent to Ombo Erdeni Khong Tayiji (Badma Erdeni Khong Tayiji), ruler (Altan Khan) of the Khotogoid people, and his spiritual mentor Erdeni Dai Mergen Nangso, a lama of Tibetan origin. This embassy lasted from August 28, 1636 to April 23, 1637 (all dates are in Julian calendar). In the course of negotiations, in early February (presumably on February 4), 1637, Lama Erdeni Dai Mergen Nangso presented the helmet in question (as well as some mail and plate armour, and vambraces) as a “tribute” to Tsar Michael I of Russia. On October 28, 1637, the helmet was deposited in the treasury of the Kazenny Dvor (Treasury Court), and then in the Armoury Chamber of the Moscow Kremlin. Based on our research we discovered that the helmet was made within the tradition of weapon-making from the late Jurchen (early Manchu) period in the second half of the 1610s to the mid-1630s at one of the workshops of the Later Jin (1616–1636) state. Thus, the helmet in question can be attributed as a late Jurchen or early Manchu helmet of the reign of Nurhaci (1559–1626) and Hong Taiji (1592–1643). The privilege of wearing a helmet with such decorations at the time of the Qing Empire (1636–1912) was granted (according to the Huangchao liqi tushi) only to representatives of a narrow stratum of the Manchu and Mongolian aristocracy — the “princes of blood” of the first and second ranks, that is, the qinwang and junwang (the bearers of the second and third most high titles in the Qing Empire). This allows us to suggest that the helmet OR–2057 could be originally made for one of the representatives of the highest nobility of the late Jurchen (early Manchu) state, whose social status was close to or equivalent to the status of persons who received the titles of qinwang or junwang during the Qing time. Thus, the helmet OR–2057 is one of the earliest known helmets to be of Late Jurchen (Early Manchu) manufacture that can be dated with a high degree of reliability and correlated with the armament of the Later Jin state’s aristocracy. The latter fact predetermines the exceptional scientific value of the helmet in question as a reference for the dating and attribution of Later Jin and Qing helmets of the first half of the 17th century from museums and private collections in Russia and other countries. On March 5, 2018, at the meeting of the Academic Council of the IOM RAS, Dr. A.E. Terekhov will submit his lecture The Apocripha (Chen-wei) as a Source of the Intellectual History of China of the 1-2 cc.